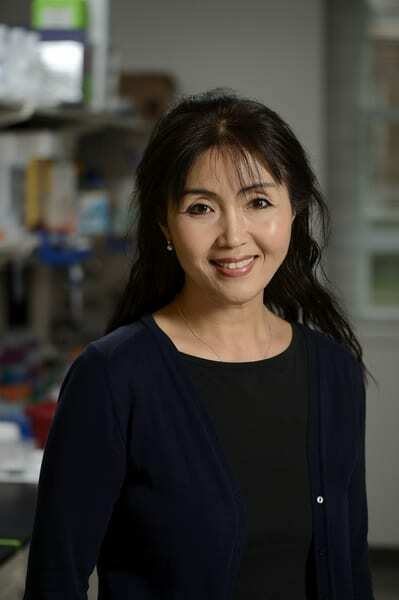 Sua Myong is an associate professor in the Department of Biophysics. Her research focuses on quantitative analysis of gene expression in single molecule and single cell. Our research is focused on dissecting biological pathways that control and modulate gene expression profiles that are pertinent to human diseases. We develop single molecule and single cell platforms to examine potential rate-limiting steps that contribute to modulating transcription and translation. In particular, we investigate RNA interference pathway and G-quadruplex DNA mediated promoter activity. In collaboration, we are also studying telomeric DNA processing and chromatin remodeling. Together, we seek to shed light on molecular orchestration and mechanism that govern the Central Dogma of Biology. Hwang H., Kreig A., Calvert J., Lormand J., Kwon Y., Daley JM., Sung P., Opresko PL., Myong S., "Telomeric Overhang Length Determines Structural Dynamics and Accessibility to Telomerase and ALT-Associated Proteins" Structure 2014 Jun 10;22(6):842-53. ( pdf ): Highlight Preview Hopfner, K-P., “Single Molecule Choreography between Telomere Proteins and G Quadruplexes” Structure. 2014 Jun 10;22(6):801-2.